French macarons are notorious for being difficult to master. Type in “macaroon,” “French macaroon” or “macaron” in your search engine of choice, and you will be inundated not only with bakeries offering these tasty little cookies, but scores and even hundreds of blogs all attempting to find the perfect recipe, the perfect technique. Which one is right? Which captures the perfect essence of macaroons? The answer is all of them and none of them. 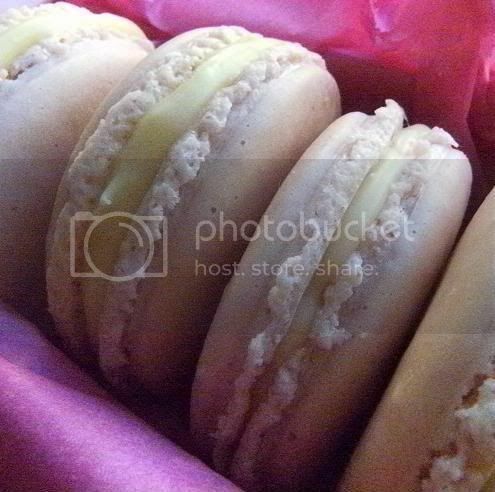 Macaroons are highly subjective, the subject of passionate, almost Talmudic study and debate. Chewy? Crisp? Age your egg whites? Ground the nuts or use nut meal or nut flour? Cooked sugar syrup, or confectioners’ sugar? In the words of a therapist, what do you think is the ideal macaroon? The answer lies within you. Sour cherry and coconut shells with home-made "white nutella"
I followed the recipe except that I had 3 day old egg whites that I had left out (covered with a paper towel) on the counter. I found the drying phase of the baking caused small feet to appear but the second baking caused the feet to increase in size a lot I usually use Helen of Tartelette recipe. 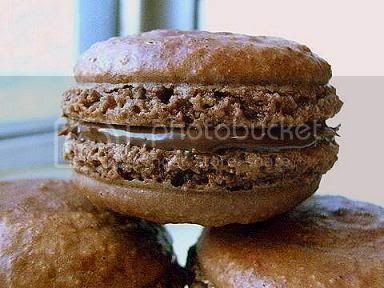 The macarons are sour cherry/coconut and the filling is home-made "white nutella". I used 1 tsp of sour cherry tea powder and 1 tsp of instant coconut milk powder added to the almond meal and icing sugar when you grind them. 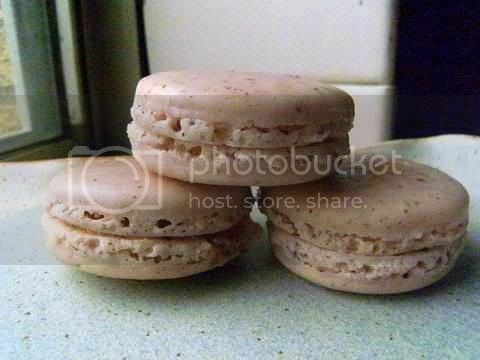 I used only 2 egg whites and I got 2 dozen filled pairs of macarons that where 30mm diameter. One of the cheapest and easiest ways of adding flavours and colours to the macaron shells I have found is to use pure herbal teas they are cheap and come in many different flavours (mint, rosehip, apple, mixed berries...) just grind them along with the almond meal and icing sugar. I have made macarons many times before and I always use 3+ day old counter-dried egg whites and 1 tsp of egg white powder which really stabilises the egg whites. I always grind the almond meal with the icing sugar in a processor to obtain very fine meal and shift it THREE times this gives the smoothest shells and also I dry the piped shells for about one hour also. This recipe is unusual in that you dry the shells in a low oven initially!!! One tip is to draw circles on the parchment paper if your piping skills aren't good enough to get even shells by eye-balling. I think the biggest tip is to use 2 or 3 baking sheets stacked on top of each other this ensures that the bottoms don't burn before the crust and feet are formed. 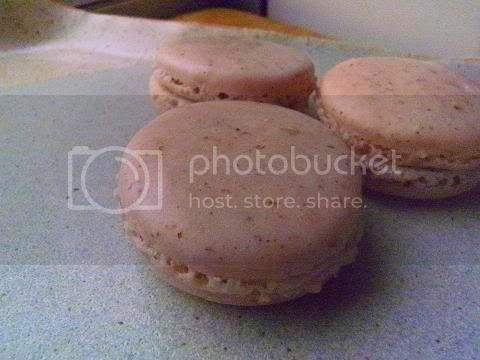 These macarons worked out much better than the first batch the feet went up straight and not to the sides. Macarons can be very sweet so I usually temper them with a slightly 'savoury' filing. Where do you get powdered flavourings and colourings? I usually use pure herbal teas (they contain no actual tea) from the health food store or the tea/coffee section of most big supermarkets they are very cheap and I grind them along with the almond meal and icing sugar it seems to work. Specialized food or colouring powders can be very very expensive about $10 for one type while a box of ten kinds of herbal teas are about $3 and they seem to work. 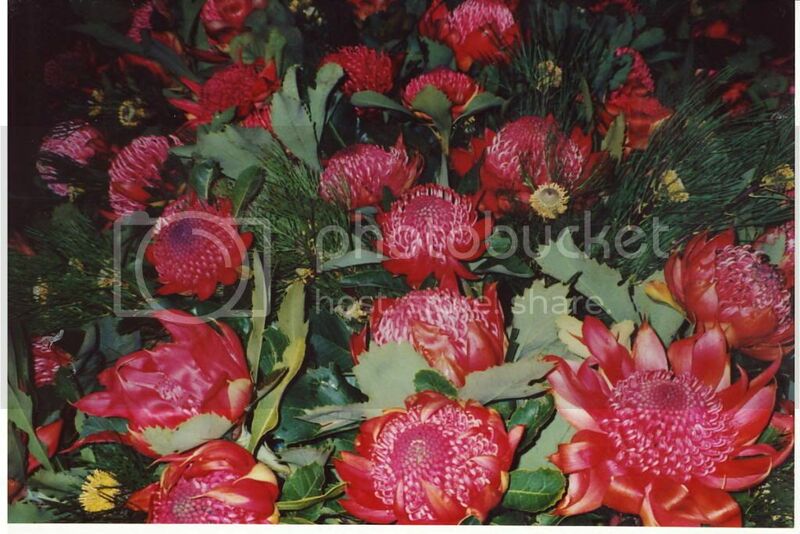 I got the watermelon powder from the local Japanese shop it was a 'tea' $1.50 for ten tea bags. I used one whole teabag for the above recipe. 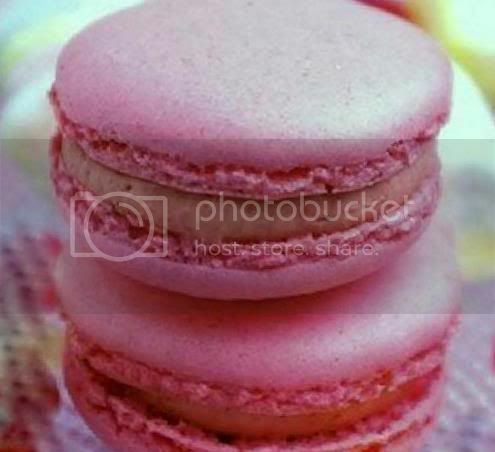 For your information below are some links to the three methods for making macarons. A lot of bloggers like the Italian method since it gives more consistent results. 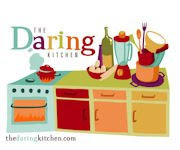 Tartelette had written a long article called Demystifying Macarons (in Dessert Magazine #2 p36-43 see this link and go to page 38) on the French method which gives a whole host of tips and hints on the process. 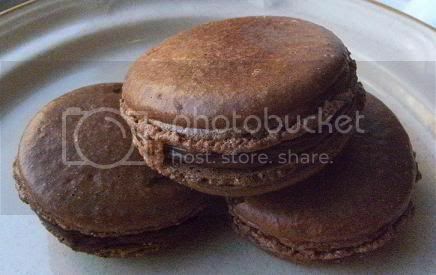 David Lebovitz web page on macarons has an extensive listing of links about making macarons. Syrup and Tang A macaron round-up which goes through the French and Italian methods in great detail and has many links to other resources. Mecotte has a long descripton of the Italian method. My Food Geek has a great Italian recipe with lots of photos. I used a 1/2 tablespoon of raspberry/blueberry tea powder in the tang tour tang (the almond meal and icing sugar mixture) and I added a mint tea bag in with the boiled cream when making the ganache. Inspite of the incessant rain they seemed to work out just fine. Start beating the egg whites at low speed, gradually increasing the speed to medium-high. If you start at high speed the air bubbles created will be less stable as they are too large. Continue beating the whites and once they have reached the soft peak stage, gradually add the sugar (this ensures that the sugar fully dissolves into the foam). The egg whites should be beaten until you have moist stiff shiny pointed peaks when the beaters are raised. Test by holding the mixture upside down and if they don't fall out of the bowl they are done (this is the classic test for firm peaks). If you are using fresh egg whites (as Helen mentioned) then continue to beat until you have 'firm-firm' i.e. very firm peaks a couple of minutes more. Since the DB recipe has so litttle sugar in the meringue (as compared to most other French method recipes) you might have to whip it longer than normal to get the correct stiffness. I used a mini food processor to finely grind the meal I placed the meal into a bowl added the sifted powdered sugar combined using a spatula and shifted the mixture twice I found that this makes mixing the 'macaronage' (the whipped meringue and nut meal together) much easier. Most recipes insist on pure icing sugar (i.e. no cornflour but this is very hard to obtain in the USA and I felt I should use it in this recipe). The tant pour tant (the almonds and sugar) should not be over-mixed or over-heated while processing because the nuts can become too oily - add vanilla in the tant pour tant to reduce oil leakage. Some sites suggest that the almond meal ideally should be allowed to dry at room temperature for up to one week prior to using. You can bake the nut meal of 5-10 mins at 140C (285F) to dry it. When using other nuts use 50% almond since almonds have the least oil content of all nuts. You can add dried zests or dried herbs at this stage and grind them along with the nut meal if you wish. You must deflate the meringue at the start of the folding process when making the final piping mixture (the macaronage). When you start to make the piping mixture you must use hard and fast strokes to release the air in the meringue this is important you don't want the batter to be light and airy or fluffy, you don't want to have air pockets or bubbles in the final batter. Use a 'fold and press' against-the-sides-of-the-bowl motion that deflates the meringue. 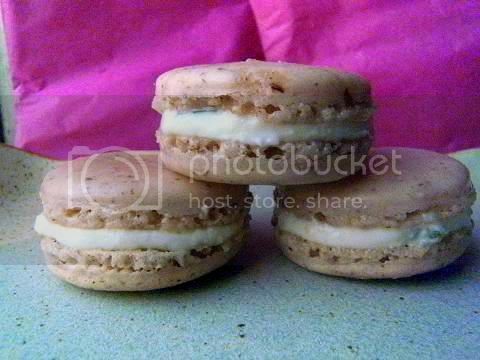 For your next batch when you are doing the folding of the macaronage (the piping mixture) watch closely. When you add the almond meal and the icing sugar the mixture (tant pour tant) will go dull now start folding hard and fast for six to seven strokes (could take more depending on your technique) to break the air out of the mixture (you are trying to deflate it) don't be gentle then slow down and fold more carefully. It is difficult to mix the almond meal/icing sugar and the meringue at first but it gets easier and a few folds later it will come together quickly, after some more folds the piping mixture will become shiny again about half to almost the same shininess as the original meringue mixture depending on how finely you have ground the almond meal and the type of colourings/flavourings used, now all the ingredients will be incorporated with no streaks and the piping mixture will be smooth, have no visible aeration (i.e. not light and fluffy and no bubbles in the batter) and it has lost about half of its starting volume, and the batter will level itself in the bowl and it shouldn't be able to hold itself up when left, also the piping mixture at this stage should fall from the spatula in gentle slow continuous ribbons, these points are what you are looking for, now start testing by placing a tablespoon of the batter in a thin line on the remaining macaronage mixture it should disappear in 30 secs if not do a couple more folds. For me a 3 egg white batter takes about 35 strokes BUT this is different for everybody you might take 50 or 20 this is something you have find out for yourself. Also the piped shells will smooth out and spread out and flatten somewhat after a short time (a minute or so) see the first video below. It is much easier if you draw circles on the parchment paper so you will get even sized shells. Draw the circles in an alternating pattern so that the circles are offset to each other (not lined up in rows like soldiers) this gives a better heat flow and makes for more evenly baked batch of macarons. Take some of the the batter (called macaronage) and smear a little on each corner of the baking sheet and place the parchment paper on the pan this stops the paper from moving while you are piping. The best piping technique (for beginners) is to pipe vertically (i.e. the bag is straight up and down) about 5 mm above the tray surface directly over the centre of the traced circle using one smooth squeeze of the piping bag until the macaronage has almost spread out to the size of marked circle on the parchment, this will give you circular shells instead of misshapen ones. It is important to maintain the same height (5 mm) above the baking surface when you pipe each shell this ensures that each shell receives the same amount of batter so each macaron will be the same size when baked. Do not use a spiral of batter to form your shell this technique is for professionals. Move the pan and not the piping bag so you can pipe directly over the centre of each marked circle on the parchment paper. Try to do the piping in one smooth motion which gives the smoothest shell. You know you have a good macaronage batter if by the time you have finished piping the whole baking sheet the surfaces of the first shells you piped have smoothed out. Then confidently bang the completed baking pan of shells down onto the counter a couple of times to release any air bubbles and to help smooth the shell of small beaks and imperfections. When you hold the bag, it feels like you are holding a soft football. Start by holding the top of the bag in the 'V' of your right hand (if you are right handed) between your thumb and index finger while the left hand helps to support and guide the bag. When you are piping the macaronage batter squeeze the piping bag from the top (not the middle of the bag) and apply steady pressure, to force the batter through the tip. Move the hand on top of the bag down when the bag begins to empty of batter. Here is a video showing a chef piping macarons. I use two stacked up-side-down baking pans this helps distribute the oven's heat in a way that promotes the crisping of the shells and the formation of the feet. I cut the parchment paper to fit the top surface. I found using up-side-down pans (which means the piped shells don't have metal sides around them) promotes better heat flow notice the sides and lips of the baking pans are under the baking surface. I don't own a heavy level double insulated baking sheet without sides so this is what I do to improvise one. I pre-heated the oven to 350 degrees F (175C) and then turned down the temperature to 325 F (160C) as soon as the shells were in the oven. 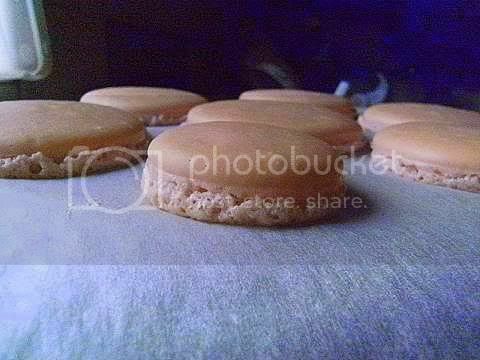 I use two baking sheets turned upside down stacked on top of each other to bake the macarons this helps in the baking process. The stacked upside down baking sheets ensure slow even heat distribution underneath the shells which means the outer surface is dried up first before the inside starts to lift it up. This is what makes that all important ‘foot’ and a smooth surface that is not cracked. I baked the shells for 6 minutes and then turned the baking sheet around and baked for a further 4 mins then I turned up the heat as high as possible and baked for two minutes longer watching to make sure that the shell did not brown). 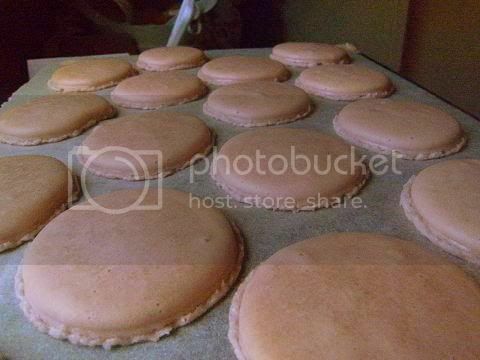 Temperature seems to be the most variable parameter in baking macarons some sites suggest 285F (140C) for 13-15 mins while some other sites preheat the oven to 390F (200C) and then drop the temperature to 320F (160c) to finish baking. The most common specified temperature seems to be a constant 300F (150C) try this temperature first then try 320F (160C) then try 285F (140C). Most ovens have hotspots (usually near the back of the oven) you can place folded tin foil or another small baking pan on a lower oven rack in these spots to even out the temperature. If your macarons are browning try placing an empty baking sheet on a shelf above your shells this delays the heat from above, Remove the shells from the parchment paper once they are cooled. They are fragile when hot. This is a common problem (try a few degrees hotter next time or slightly longer next time) the bottoms of the macarons didn't dry enough and are very sticky and leave the belly of the macaron behind when you lift them off the parchment paper. Solution 1 - don't peel the macarons off the paper just leave the stuck macarons on the paper on a drying rack for a few hours (or overnight) and then peel the paper off the macaron carefully. I usually use scissors and cut out a row of macarons and then peel them so that way I can handle a few at a time instead of the whole sheet. 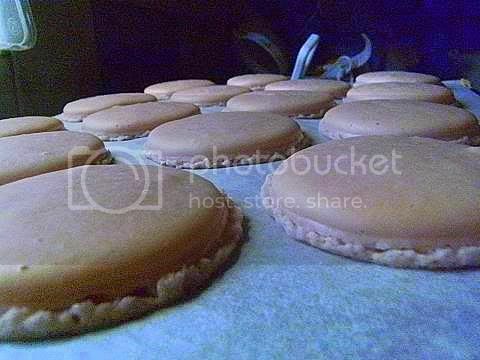 Solution 2 - Leave the macarons out for about 10 mins and then place back into the cooling oven with the door ajar. Make sure the oven is only warm should be ready in less than an hour. Solution 3 - Place some barely moist paper towels on top of the hot baking sheet and place the parchment paper with the sticky macarons on top of the towels. This creates steam which helps with the removal of the shells. A lot of sites said to use a few drops of water under the parchment paper but I found this to be a little "miss-and-hit" where the steam is formed. Solution 1: Leave on the paper and let them air dry for a few hours or overnight on a wire drying rack - no they will not "sweat" and in fact macarons store at room temperature really well and really need a few days to taste their best. It's a matter of patience they will dry out. Solution 2:Turn the oven off for 10 mins and then place the stuck macarons back in the cooling oven (check that the oven is warm) with the door ajar this helps dry out the shells and not cook them. I usually leave them for an hour in the cooling oven and then check to see if I can remove them. Solution 3: Is the traditional solution and mentioned in nearly all recipes but to be honest I don't like this method too much it's too hit and miss and I never know how moist to make the paper towel (too finicky). 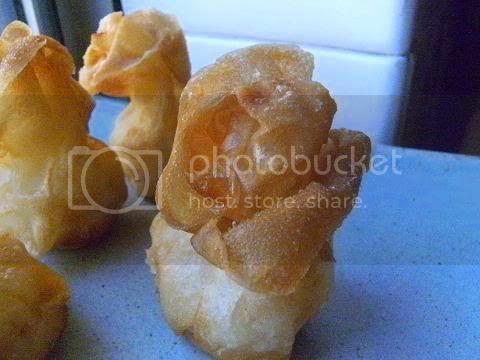 Also the peaks didn't sink after being piped – did you test the batter by placing a tablespoon of the batter in a thin line on the remaining batter and seeing if the line disappeared in 30 secs if this doesn't happen then do a couple more folds and test again. The batter was a bit lumpy. I used almond meal from a packet which I sifted and mixed with the sifted icing sugar yesterday. Am I supposed to grind this in a food processor to get it finer? If you want a smoother batter yes you can grind the almond meal and the icing sugar in a processor but this is an appearance issue a slightly lumpy shell due to coarse almond meal doesn't affect the taste just the looks of the macaron shell. I tried to count the strokes because I didn't want to overfold again but accidentally counted strokes when I was getting batter from around the side of the bowl so I think I would have done more than 18 strokes, maybe 25ish. Everybody has a different folding method so has a different number of strokes so don't be worried about this too much it just gives a rough idea when you are near to the correct consistency. Do the test mentioned above (the line of batter disappearing in 30 secs) which is the best method until you get more experience and can see and feel when it is correct. My stoke technique must need some practice because I always go waaaay over 20 and that's with just one egg white so it should be less. No no no the number of strokes is dependent on how you fold if that number is waaaay over 20 well that is your number and that is right for you and looking at your last batch you are doing it about right. I definitively had stiff peaks coz I held the bowl upside down for a while and it didn't fall out. 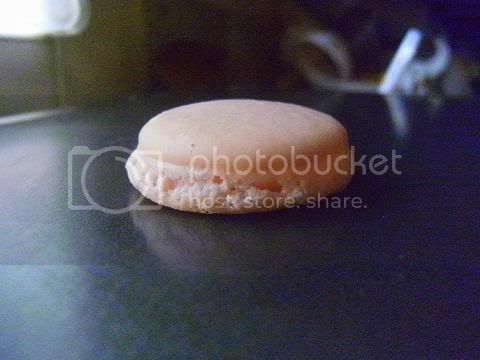 Good to hear this helps a lot, this means we know the problems are in the later stages of the macaron making process. As Helen mentioned in the other thread to John of eat4fun..... "Using new eggs increase the chance for flat macarons with tutus instead of feet but you can still get very good macarons with new eggs. The trick is having your meringue stiff enough before adding the nuts. Make sure your meringue is stiff-stiff not just "it's stiff I am stopping whipping now" if you know what I mean." 3. 'no feet' have formed. It seems to me that you didn't fold enough and maybe your folding technique might need to be looked at because you have lots of bubbles could mean that you didn't fold hard enough at the beginning of the 'macaronage' stage (the stage were you fold the almond meal and icing sugar into the meringue). At the start of the macaronage stage you have to fold hard and fast (the first half dozen stokes) to knock out some of the air in the whipped egg whites this helps form smooth baked shells, then you fold more slowly and carefully as you continue until you get the consistency of “very cold honey” or "lava" or "magma" as it is called. It is difficult to incorporate the almond meal and icing sugar at the beginning but it does become easier. I found when the batter becomes shiny again it is about right. Check by placing a tablespoon of the batter in a line on the remaining macaronage mixture it should disappear in 30-60 secs. When I make a full batch I check after about 30 stokes. 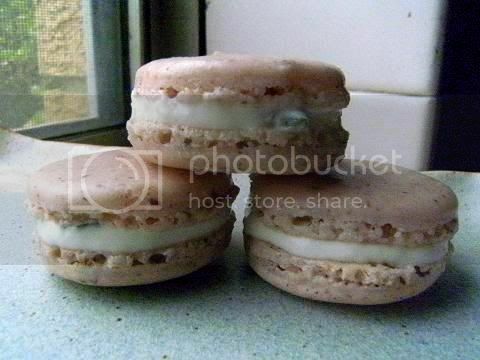 And yes I do count out loud when I make macarons it makes me concentrate on the 'macaronage'. Also lots of bubbles might mean that your folding technique is incorporating air into the batter and forming extra bubbles. With the spatula cut into the centre of the mixture then scrapping along the bottom of the bowl bring up the batter from the bottom and fold it over the top then turn the bowl a quarter turn and continue cutting, folding and turning until your batter is ready. Don't be gentle at first you want to mix all the ingredients quickly then once all the ingredients are combined slow down and concentrate on the look and feel of the batter. Also when you have formed the piped shells pick up the full baking sheet and confidently bang it on the counter this helps to smooth small imperfections in the piped shells. This really does work I was very skeptical at first but it does seem to work. Also if you find that the shells were firm and chewy then bake them for less time or at a lower temperature. Another thing it could be is that you have overmixed your meringue causing them to become dry. Only whip the egg whites until soft peaks then add the sugar slowing until they become shiny and firm the way I judge is to hold the mixture upside down and if they don't fall out of the bowl they are done (this is the classic test for firm peaks). Start beating the egg whites at low speed, gradually increasing the speed to medium-high. If you start at high speed the air bubbles created will be less stable as they are too large. Continue beating the whites and once they have reached the soft peak stage, gradually add the sugar (this ensures that the sugar fully dissolves into the foam). The egg whites should be beaten until you have moist stiff shiny pointed peaks when the beaters are raised. If you accidentally over-beat the egg whites, add one unbeaten white and whip again until stiff peaks form. Remove 1/4 cup of egg white. Did you use large eggs 59 grams (2.1 ounces) for the recipe? Maybe your ingredient ratios are out. Do you weigh or measure by volume the macaron ingredients they really need to be weighed out, the ratios are important in this recipe. Icing sugar volume is heavily dependent on the moisture in the air. The issues with your oven – it seems that your oven is very temperamental it seems to overshoot the required temperature, is erratic in behaviour when going from a high temperature to a lower temperature, has 'hot' and 'cool' spots, each oven shelf has a different temperature and the oven turns itself off if you open and close the door too often. In your case I would pipe all the macaron shells and let them air dry on the counter until they are touch-dry (about 30-60 mins) and then bake only one lot of piped macarons at a time on the middle shelf in a 300F (150C) oven for 12-15 mins (it could take longer). This procedure means that the shells are dry and your oven only needs to keep one constant temperature instead of two temperatures and you won't have different shelf temperature problems. It might take longer but you will be able to reproduce the same temperature conditions for each lot of macarons that way you will get more consistent results. Because at the moment your oven conditions are confusing the baking results. In fact I think it is worth the time and effort to test your oven by using your oven thermometer and just heat the oven to 300F (150C) and see how long it takes to settle to that constant temperature so you know when to turn the oven on to get the correct temperature when you do your next batch, For example it might take 15 mins for your oven to settle to a constant 300F (150C) so you know after that time you can start baking your touch-dry shells. Another test to do is open the door for the same time as you would do when you are placing a baking sheet of macarons in the oven then close the door and check how long it takes for the oven to get back to 300F (150C) if it takes longer than 5 mins you might have to preheat to a higher temperature (for example 320F or 160C) and when you place the real macarons into the oven then immediately turn down the temperature to 300F (150C) this way the macarons are at the correct temperature for most of the baking time. As I said a lot of macaron making is understanding your oven and the other half is technique. Hope this make the use of ratios clearer. Recipe Source: Jaden of Steamy Kitchen from her new book The Steamy Kitchen Cookbook. 1.A fresh fragrant noodle soup from Vietnam called phở I have had phở at the local shops and it's such a calming health-restoring concoction it bursts with the flavours of toasted star anise, cloves and coriander and charred ginger and onion in a flavoursome broth that is clear and full of yummy ingredients. We could either make the quick version using store bought stock see recipe below, or, you can make the longer version listed here, or the beef version listed here. 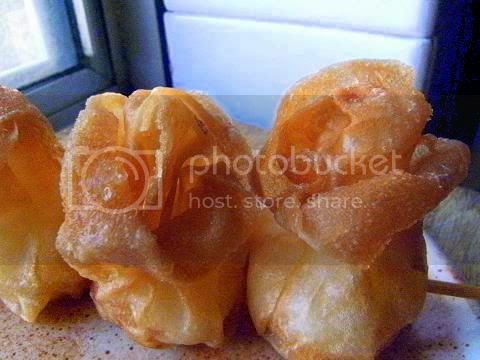 2.Sweet deep fired wontons with our choice of filling. Also this month we had the extra bonus of a competition for the best photograph of the phở and the most creative filling in the wontons. Thank you Jaden of Steamy Kitchen a fabulous recipe for pho. This is the most delicious challenge so far I think and that is saying a lot. Here is a great site that lists the various phos available and has audio recordings on how to say them also. 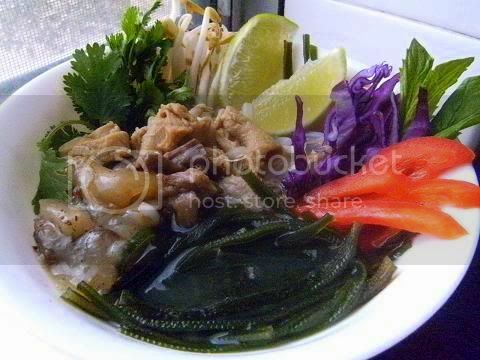 See here for a discussion about the Qualities of a Great bowl of Pho. I thought I would do a number of each. Since there wasn't a seafood stock recipe supplied I used the fish stock I made for Olga's Spanish Seafood Challenge. I made a home-made super concentrated fish/prawn soup stock (see below) the specks on top are powdered seaweed (kelp). 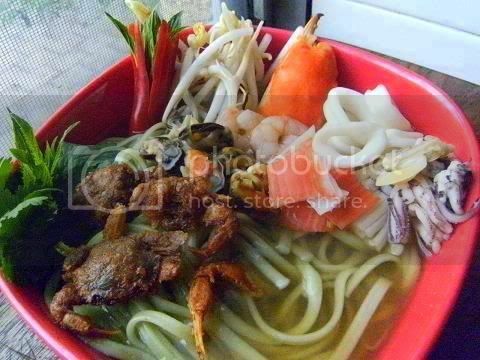 I used about 4 kgs of fish bones/prawn shells to make the soup stock. It was solid when cooled. I used the spices that were required in the reveal challenge. 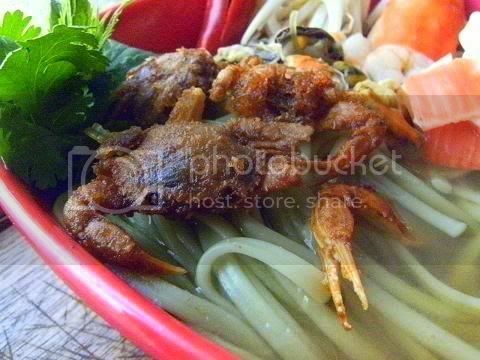 This formed the basis of the pho. The soup stock is the most important component of the recipe it must be super tasty and very flavoursome with a large amount of bone marrow. 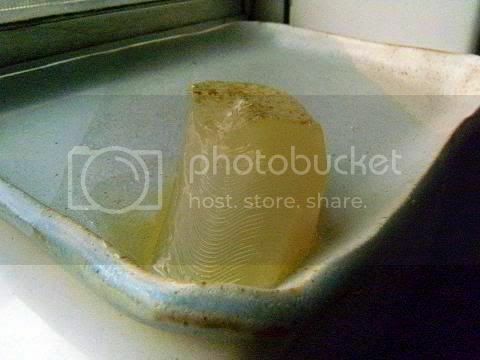 It is very hard to make fish stock solid at room temperature this shows how much fish bone-marrow and prawn shell-gelatin was extracted. Since so much marrow and gelatin was extracted the stock had an excellent mouth feel and a depth of flavour that was deep and mellow. It smelt of the ocean and tasted DELICIOUS, it sure packed a punch! Certainly the BEST stock I have made in my entire life. Also the burnt ginger and onion really added to the complexity to the soup. I spent a lot of time making the soup clear, constantly skimming the scum off the simmering soup, using the 'raft' (consommé) method to clarify the soup then straining through fine muslin cloth a few times. This is the reason why the soup is so clear. The results were worth it. Some ingredients for the soup also I used seaweed noodels. 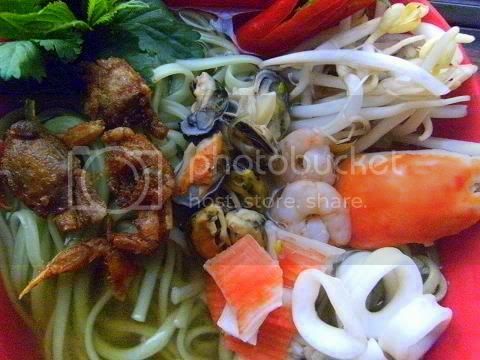 Seafood ingredients for soup – prawns, clams, mussels, crab claw, octopus, cuttle fish, fish sticks, seasoned seaweed and flying fish roe (eggs), deep fried baby crab, and sea urchin eggs. This amount is for one serving! This was a very expensive soup about $4 per serve. 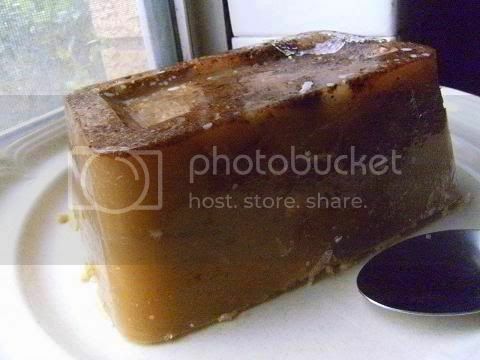 Below is a 1 litre block of stock made from roast beef bones, beef feet and beef tendon that had been simmered for many hours until the tendon melted completely. 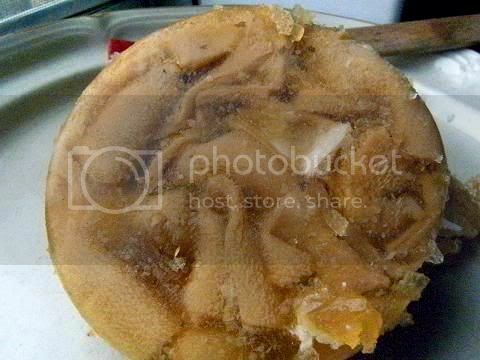 I always leave the shredded cooked meat in the stock when I chill it in the fridge since the gelatinous stock preserves the meat I have even used this as a brawn. If I need pure stock I remove the meat by straining when I reheat it. It is hard to see from the photo but you can see through it. Superior mouth feel Pho with tendon, beef and tripe and home-made basil/coriander/mint noodles. I wanted to make a pho that had a superior mouth feel so this pho has a large quantity of tendon that had been simmered until it was mouth-meltingly soft, with was served in a tendon, roasted beef bone and beef feet stock. This pho had an incredible texture yet still light and fragrant. Served with home-made basil/coriander/mint noodles. Here is tripe stock simmered for 8 hours it is coloured pink. Again I always leave the meat in the stock when I chill it. It preserves the meat really well. 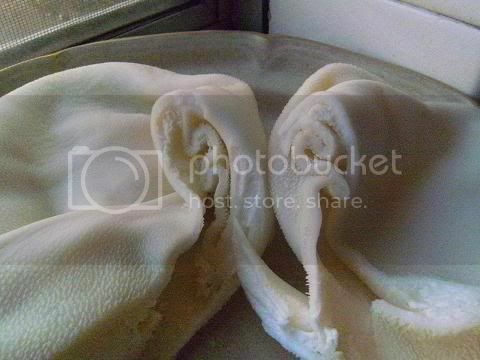 Pure tripe stock is so so good and hard to find nowadays except at home it is under-valued. 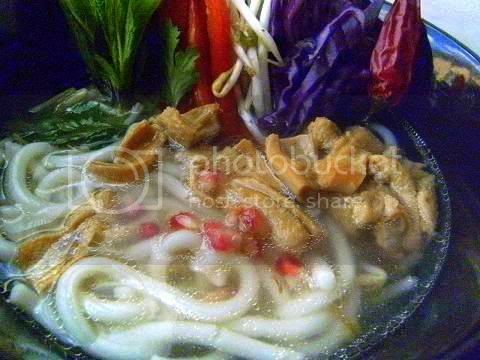 The tripe in this pho was simmered until tender and pink. 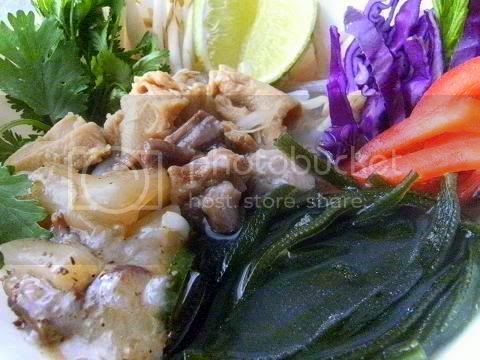 A delicious offal pho served with rice noodles. Quail eggs where on special two dozen for $2 so I thought I would go with them and they would fit into a wonton parcel so well. 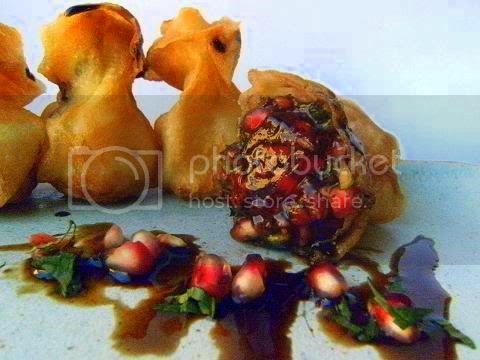 And since poultry eggs and fish roe go so well together I thought I would do savoury wontons. 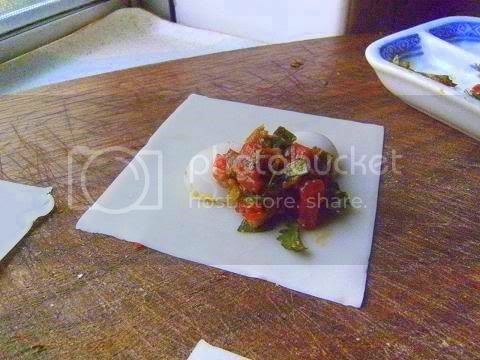 I made home-made wonton wrappers using the Chinese pot-sticker challenge recipe. 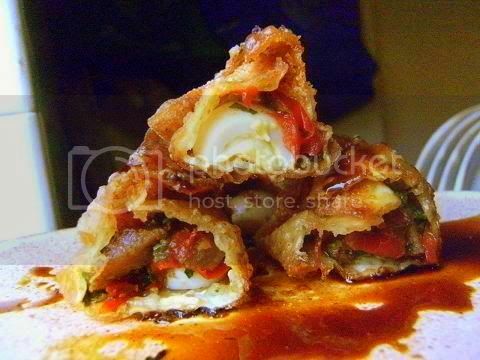 I wanted a very rich voluptuous luscious wonton and two types of eggs would do that and I thought that sansho (a Japanese spice that heats and cools the taste-buds) would really add some interest to the filling. 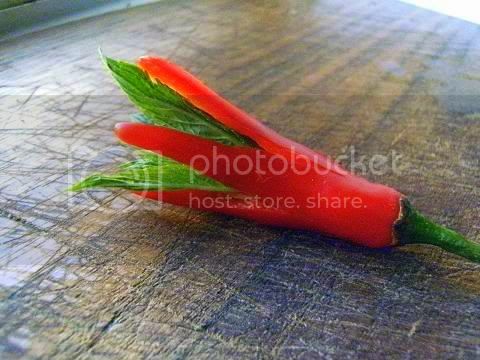 Cool mint and hot chilli would further accentuate the affect of sansho. It took a few tries to get the spice/herb mix correct so I got hot/cool, sour/sweet and bitter/salty and umami well balanced. The final taste test was a wonton that exploded richness with the charred, roasted and toasted vegetables giving a mellow depth of palate pleasing substance. The sansho and the mint/chilli and other ingredients seemed to cause an oscillation in the taste-buds they couldn't or wouldn't want to decide which taste sensation the wonton was hot or cool, sweet or sour, bitter and umami, this finely tuned balancing act between opposite taste sensations was so delicious I could of eaten all 12 myself. I served them with mushroom oyster sauce (which adds umami taste). Yumminess personified. 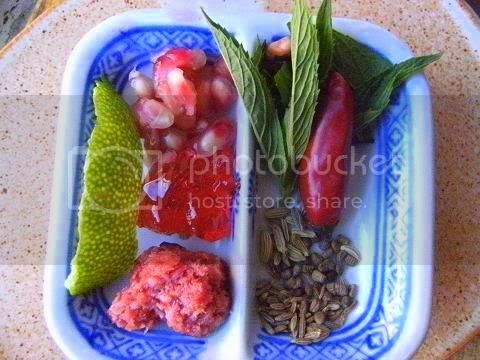 Ingredients for my egg on egg savoury wontons – quail eggs, flying fish roe, and a rough chop of red chillies, red roasted capsicums, a lot of mint, coriander, charred ginger/onion, fresh and roasted garlic, and a little spicy hot Chinese sausage, salt/sugar. The speckles on the quail eggs is sansho (ground Japanese prickly ash tree pods) which is delightful spice that heats and cools the taste-buds at once. Flying fish roe has a lovely crunch and then a ooze of flavour they went well with the quail eggs and the sansho with the chilli/mint/coriander and charred ginger/onion really produced a lovely constantly changing taste experience (that is oscillating between the different taste sensations) in each bite. Very unusual and such an interesting taste experience. Yum Yum. I had a few of my mates from the footy club over and they like to have boozy desserts. So I thought for experimental purposes that I would do inebriated fruit as the filling. 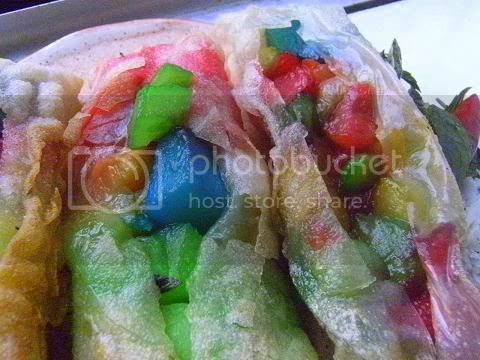 I soaked the fruit pieces for 3 days in highly coloured liqueurs which produced a lurid coloured filling for the wontons. They were very strong and I suggest only one is enough. Pretty good and a very unusual filling for a wonton. Serve with plain ice-cream. 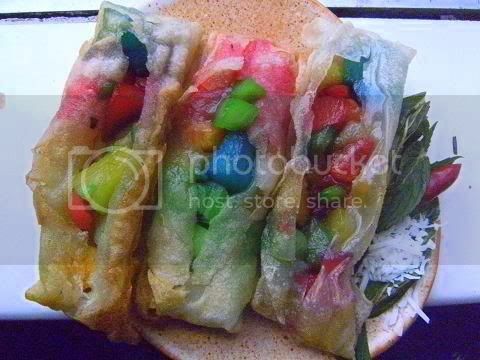 I thought the filling would have too many flavours but that wasn't the case, the pieces keep there own flavours and it was nice to eat the fruit pieces and the crispy wonton wrapper with the ice-cream. This filling was very brightly coloured!!! It literally gave me the shudders because of its visual violence and its frightening alcohol content. You can have too much of a good thing. It provoked a lot of comments mainly surprise on how good it tasted and fearfulness on its jarring visual discordance. Starting from the top bright red fruit pieces - watermelon in red cherry liqueur, pear in pear liqueur, green dewmelon in dewmelon liqueur, mango in banana liqueur, cherries in clear chocolate liqueur, pineapple in vodka, grapes in sweet wine, and the bright blue is apple in Blue Curacao liqueur. 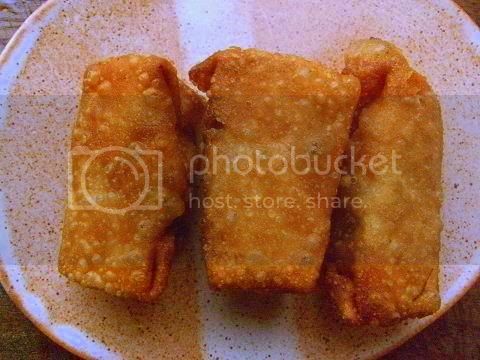 I wrapped the highly-alcoholic filling in rice paper wontons and then deep-fried them. They look very pretty when covered in the fried rice paper. 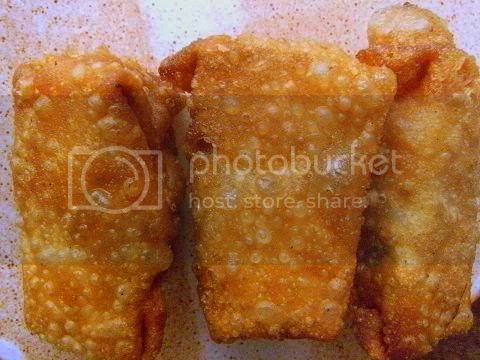 I wanted to make wontons that exploited all the six taste sensations which come in three opposite pairs – (sweet/sour), (salty/bitter) & (umami/fatty acid). 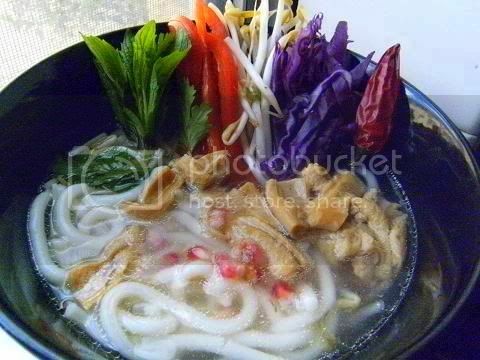 Most people are familiar with the first 2 pairs of tastes while umami is the savoury taste sensation in mushrooms or soy sauce and fatty acid is the fatty mouth-feel taste sensation in gelatinous soup stocks. So I designed a sweet wonton filling that had all these six tastes combinated in a way that simulated and enhanced each of these sensations. Also I wanted a beautiful looking wonton when cut. After I deep-fried the wontons I lightly coated them with salt and which gave the salty component, pomegranate/rose/cherry/coconut gave the sweet component, lime zest gave the sour component, bitter orange peel gave the bitter component, while a combination of Ketjap Manis, basil syrup and olive oil gave the umami and the fatty acid components. I added a number of herbs and spices (including cocoa) to compliment the six taste sensations. The syrup was exactly right for the sweet wontons. It really added the correct flavour contrast to the taste sensations of the wontons. Certainly the cocoa, cardamom and fennel were the winners in the filling. It took about 3 attempts to get the filling ingredients correctly balanced. The taste-testers (and I ) really liked the salty at first wontons then the sweetness of pomegranate with an rose/cherry/coconut overertone and the contrasting taste of the syrup and finally a spicy cocoa/cardamom/fennel undertone that completed the experience. It was very well-balanced. Filling - Pomegranate, rose jelly (gello), cherry, coconut, mint, lime zest, bitter orange peel, lemongrass, cocoa powder, cardamom, cumin, fennel, chilli with a reduced Ketjap Manis/basil/olive oil syrup. I was very pleased when I cut them the wonton filling was glossy and full of lovely rose jelly (gello) showing off the pomergranate and mint. The cut wontons looked like glass-flowers! Ketjap Manis/basil/olive oil syrup. Make a simple syrup from equal quantities of water, sugar, olive oil and ketjap manis (combine in a saucepan, bring to a boil and stir until the sugar has dissolved). Cool to room temp. Add rinsed basil leaves in the ratio of 1 bunch to 1.5 cups of syrup and blend into a purée. 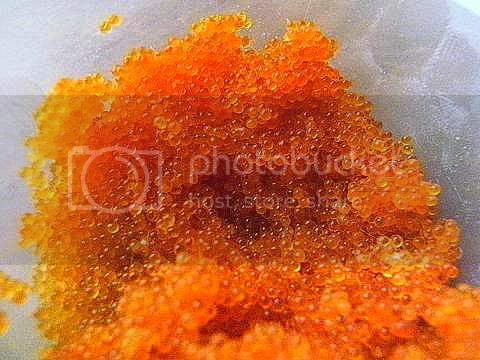 Allow to macerate 20-30 minutes, then strain through a fine mesh sieve and refrigerate. 1. 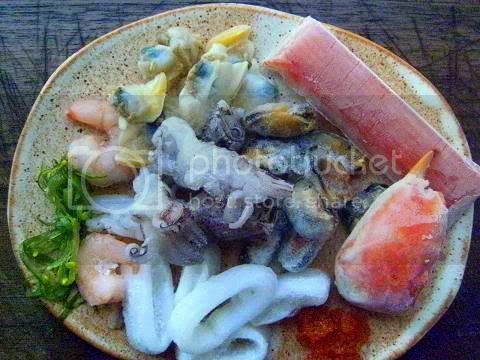 You like: chicken, beef, pork, seafood or vegetarian/vegan. 2. There is no variation allowed with regard to seasoning. You must use the spices listed in the recipe and they must be toasted. 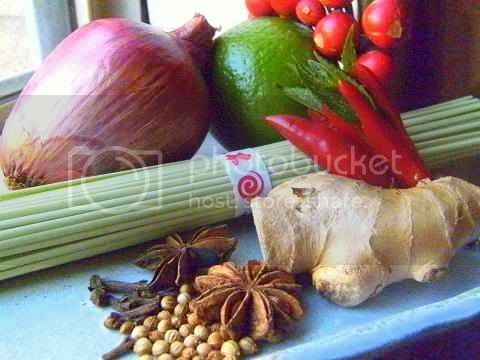 (Only leeway here is if you cannot use the spices for health/dietary reasons.) 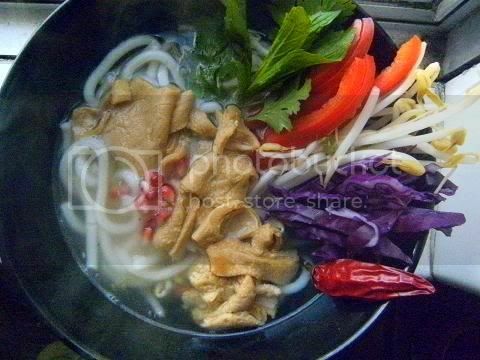 *Note: Use same spices as listed in the chicken Pho recipe for pork, seafood and vegetarian/vegan variations. The beef variation lists it’s unique spices in the recipe. 1.To make the Chicken Pho Broth: heat a frying pan over medium heat. Add the coriander seeds, cloves and star anise and toast until fragrant, about 3-4 minutes. Immediately spoon out the spices to avoid burning. 2.In a large pot, add all the ingredients (including the toasted spices) and bring to a boil. 3.Reduce the heat to medium-low and let simmer for 20 minutes, skimming the surface frequently. 4.Use tongs to remove the chicken breasts and shred the meat with your fingers, discarding the bone if you have used bone-in breasts. 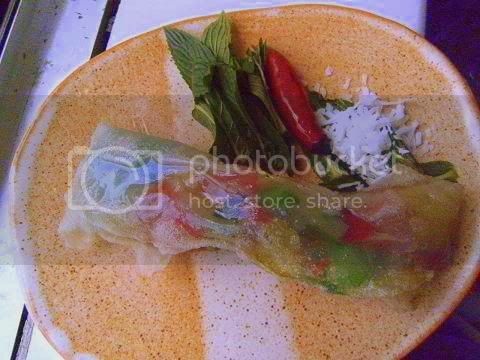 5.Taste the broth and add more fish sauce or sugar, if needed. Strain the broth and discard the solids. 6.Prepare the noodles as per directions on the package. 7.Ladle the broth into bowls. 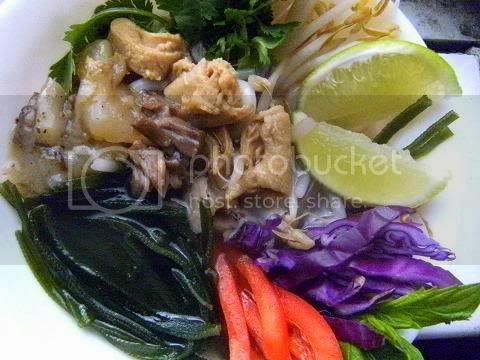 Then divide the shredded chicken breast and the soft noodles evenly into each bowl. 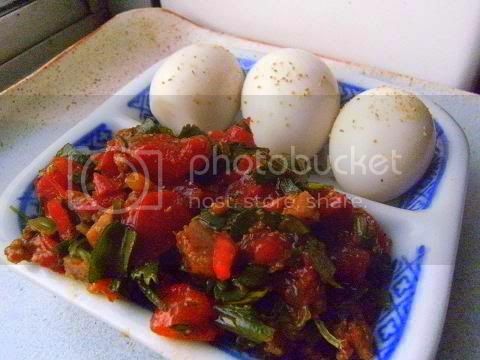 8.Have the accompaniments spread out on the table. 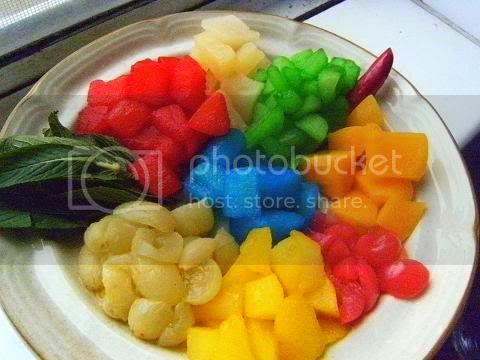 Each person can customize their own bowl with these ingredients. *Note: This second dessert challenge is about being creative with filling and form. Knock yourselves out! 1. Can be shaped any way you want, not just triangles as pictured. Can even be layered like napoleons. 2. Can be filled with your choice of filling, doesn’t have to be chocolate. But the fillings and final wonton must be SWEET - these are DESSERT wontons - to be eligible for a chance to win a book. 3. Creativity counts with this bonus dessert recipe for a chance at winning a copy of Jaden’s new cookbook! 1.In a small bowl, whisk together the egg and water to make an egg wash.
2.On a clean, dry surface lay 1 wonton wrapper down with a point toward you, like a diamond. 3.Place 1 piece of chocolate near the top end of the wrapper. 4.Brush a very thin layer of the egg wash on the edges of the wrapper. 5.Fold the bottom corner of the wrapper up to create a triangle and gently press to remove all air from the middle. Press the edges to adhere the sides. Make sure the wrapper is sealed completely. 6.Repeat with the remaining wrappers and chocolate pieces. 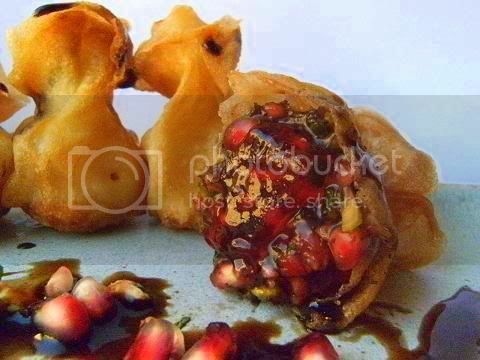 7.Keep the folded chocolate wontons covered under plastic wrap or a damp paper towel to prevent them from drying. 8.In a wok or medium pot, pour in 2 inches (5 cm.) of high-heat oil. 9.Heat the oil to 350º F (180º C) and gently slide a few of the chocolate wontons into the hot oil. Make sure you don’t crowd the chocolate wontons. 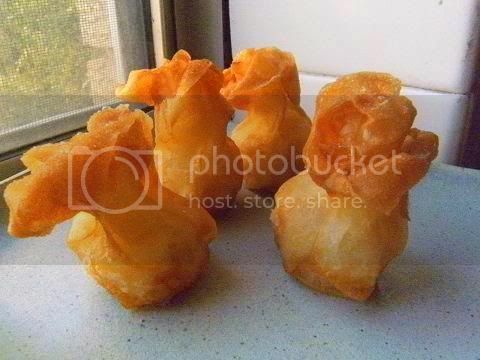 10.Fry the wontons for 1 ½ minutes, then flip over and fry another minute until both sides are golden brown and crisp.